I want to know if I can simply install Leather seats from the C-MAX SEL and expect the driver's side power motor to work. FYI, I have an SE with cloth interior and no seat heaters. You'll need to search around under the SE seat and floor to see if the other end of the electrical connector is there. I would think the sub-harness will be there. I would suggest looking in some of the bigger junkyards. Probably a few wrecked ones out there. I have the leather seats in my NRG and don't like the leather very much. It isn't ventilated and doesn't breath worth a darn in hot weather. I finally spent a few hundred to buy sheepskin to cover the leather up and make it more comfortable in hot weather. Taz, did you go with black? we have the light stone and they never seem very hot. Light stone in ours. The problem is after you've been driving for a few hours, there is no "breathing" or ventilation of the seats. This results ina very sweaty back and nether regions. When you are driving you can't really move around too much. Factor in that you can go about 7 hours on the highway before refueling and the seats are what dislike the most about taking a trip with the car. They could also use a bit more thigh support as well. The AC can keep the rest of the car nice and cool but the seats just don't allow for any air circulation. If that had done some serious perforations then it would have been much better. I feel like my back is coated in saran wrap and can never breath when stuck in the seats on a hot day for a few hours. As I said the sheepskin does help but I'd rather have some sort of ventilated/AC seats. I'm not in the car that often and if it's summer you won't find me in anything but shorts, lol! We have only done the trip from Nebraska to Indianapolis, when we bought it, a few trips to Cincinnati and up to Michigan City to see my grand baby. The cloth seats in my 2004 Focus still look brand new, I don't see that happening with the C-max. My other half and I both tried to like the leather seats while doing test drives. Just a few miles and we both felt sticky. Just did not like the feeling. A friend of mine has leather seats in a Chrysler 300 and he said they went for a short drive and someone said to him when they got out of the car that his back was noticeable wet when he got out of the car. I just don't get the leather seat thing. They look good. Even in the house I never like them for sitting on. People do like them though, to each his own. Yep, the leather seats is one of the main things that kept me in an SE rather than an SEL. 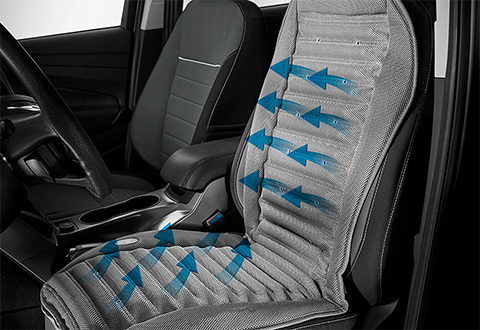 I would have walked away from the C-max if I had to endure difficult-to-clean, poorly-wearing, car-aging cloth seats. Get the coolest ride possible with the Cooling Car Seat. This innovative air cushion provides circulating air flow for your back, legs and thighs, while reducing perspiration and absorbing body heat. It fits in all vehicles — simply plug it in to your car’s cigarette lighter and press the power button. Features 18 ventilation holes and adjustable low/high airflow control. Plugs into an auto cigarette lighter. Edited by Robert Fugate, 04 August 2015 - 08:27 PM. Have you tried it out? It looks like something that could be very helpful to those of us in warmer (hot) climates. Just curious how well it works and how well it holds up. That cooler just circulates air. It does not have any active cooling like in the Fusion. Getting back to the topic, I did swap in a Leather driver seat into my SE which is without heating. The seat harness plugged right in but inside the SE plug a few pins were missing. As a result, the seat motors wouldn't work and I abandoned the installation. It's too much work to add a few wires and fuses for me at the moment. There wouldn't be a 5-position dial for the seat heaters on the SE dash, no? I installed an Infiniti electric seat in a GMC van, but it did take a load of research and re-wiring to get the seats and the seat heaters to work. The seat heater dial is by the shifter just like the SEL. One of the 1st C-Max's I saw had seats with heaters that were added by the dealer. The dial was on the seat base on the side. Must have been aftermarket. has anyone successfully done this? ...modified the SE for SEL seats?